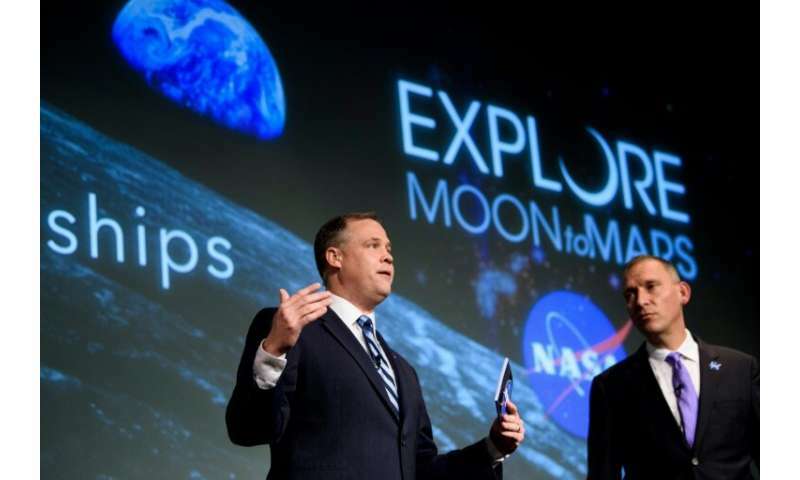 Jim Bridenstine, NASA's administrator, said Tuesday that in order to achieve that goal, other parts of the program—including a lunar landing—need to move forward more quickly. A round trip to Mars can only take place when the Red Planet is positioned on the same side of the Sun as Earth—that occurs about every 26 months, so the dates are 2031, 2033, and so on. SpaceX is likely to be ready 5 years before that. The SLS is the first launch vehicle made entirely of pork. Sounds great! But it is one thing to talk the talk and another to walk the walk. The orbital mechanics for 2033 are very favorable and I understand this has been the internal working date at NASA for a long time. But to be candid, it is going to take a serious realignment of NASA priorities, significantly increased funding and closer than ever cooperation with SpaceX, but I still believe it is achievable. If done properly, I also believe the world will revel in the achievement of putting people on Mars in a way that is hard to imagine today. People want to be part of something great, not just waiting around for dystopia to hit. Alternatively, we can continue pretending we will get beyond LEO again and inspire exactly nobody. Vast majority of people on planet wouldn't believe it. Nuke the worthless ISS out of orbit now, NASA and the U.S. might have the money to do this. However, junky chemical rockets while being acceptable to go to the Moon (though it'll cost $400B this time, compared to $40B in the 60's) but a successful Mars mission where you don't get everyone killed will need nuclear propulsion, ideally Project Orion explosive propulsion. All these other technologies are worthless from "solar sails" to ion engines. TB, where the heck do NASA and other space agencies obtain the information, knowledge and experience required for successful medium to long term survival of people and hardware in space - such as on a 6 month voyage to Mars, a year there, and another 6 months return journey - without the ISS as a laboratory and test facility for achieving this? Sure, a suitable propulsion vehicle will be necessary to get them there and back, but that is just one aspect of the requirements for a survivable Mars mission. TB, did you ever watch Star Trek? In that imagined future, spaceports are often gigantic and elaborate structures. Spacecraft of all shapes and sizes go to spaceports for everything from exchanging personnel to getting supplies to serious repair work. They tend to be very busy places necessary for supporting robust space exploration by a veritable fleet of spacecraft. There is no reason ISS can't be our first spaceport. We have to start somewhere.